Now Foods NAC is a dietary supplement with 600mg of NAC (N-acetylcysteine) which delivers the right form of cysteine and stimulates the production of glutathione - the guard of human health. The product is enriched with selenium in the form of selenomethionine and molybdenum. Those minerals strengthen the beneficial effect of NAC and have a strong synergistic and supporting effect. N-acetylcysteine (NAC) - an N-acetyl derivative of cysteine, which is a biologically active and safe form of amino acid. It is absorbed nearly entirely in the gastrointestinal tract. It increases the natural level of glutathione, neutralises harmful metabolites of drugs (mainly paracetamol), reduces the risk of nephropathy (disease of kidneys) as well as shows effectiveness in treating AIDS through inhibiting the activation of protein NG-kB, which results in that HIV genes are not transcribed. It shows anti-inflammatory and antioxidant features, thanks to which it neutralises free radicals in inflamed or anoxic cells. Cysteine is a proteinogenic, sulphur-containing amino acid which is a component necessary for normal functioning of the organism. It contains the thiol group (-SH), thanks to which it is capable of creating disulphide bridges and, thus, influencing many protein structures. It is created in the organism as a result of the reaction between methionine and serine. Through oxidation it is transformed into cystine, and through decarboxylation - to cysteamine. It is a taurine precursor and the most important component of glutathione (apart from glycine and glutamic acid), as its thiol group (-SH) is the active group in redox reactions (oxidation and reduction), where glutathione performs its main functions. As cysteamine, it is one of the precursors (apart from ATP and pantothenic acid) of coenzyme A (CoA), and its thiol group (-SH) is the active group of that coenzyme and it enables the biding of the acyl group, through which the acetyl-CoA is created. Coenzyme A takes part, among other processes, in the biosynthesis of cholesterol and, in turn, steroid hormones, acetylcholine synthesis, catabolic reactions which lead to energy release (Krebs cycle) and in the process of neutralisation an removal of sulphonamide. Glutathione is the most important antioxidant and detoxicant present in every body cell. It is called the guardian of human health. It is a tripeptide which builds living cells, made of the amino acid residues of glutamic acid, cysteine and glycine, and the most widespread intracellular thiol, that is the compound containing sulphur. It removes heavy metals, protects the liver, fights free radicals and supports the immune system, and its low level means that there are medical problems in the organism. Paracetamol is a popular and widely used painkiller and anti-inflammatory agent. However, not many people realise how toxic it is. Used too often or in large doses, it leads to the gathering of its toxic metabolite - N-acetyl-p-benzoquinone imine (NAPQI) in the organism. The metabolite is commonly neutralised by glutathione but when the its amount is too big, the natural reserves of glutathione are not enough to manage it. In that situation, a reaction between toxic metabolites and the crucial liver enzymes occurs which leads to damage to liver cells and, in turn, to acute liver failure. The above-described situation may also occur with toxic metabolites of different drugs, as well as various toxins, which makes NAC a perfect preparation protecting liver from many orally administered medications. Acetylcysteine preparations are also registered as mucolytic medications, which facilitate expectoration and reduce the amount of mucus accumulated in respiratory tracts. Thanks to free groups containing sulphur atoms, acetylcysteine is able to split glycoproteins of mucus into smaller particles, liquidise it and reduce its viscosity. It improves the activity of respiratory mucous membranes without disturbing the natural cough reflex. It also demonstrates antioxidant features, thanks to which it neutralises free radicals in inflamed or anoxic cells. Transformed into cystine, cysteine increases the release of glutamate (glutamic acid) in extracellular space, which activates the glutamatergic metabotropic receptors from group II (mGluR2, mGluR3), and in greater doses of NAC - also the receptor mGluR5 from group I.
Glutamic acid is an important stimulating neurotransmitter in the nervous system; it constitutes the process basis for the creation of traces of memory, and, in turn, the ability to learn and memorise. Another of its effects on the central nervous system is increasing the amount of glutathione, which is also probably an endogenic neuromodulatory transmitter. It is able to activate the NMDA and AMPA receptors in different ways, and recently it has been discovered that it has its own receptors in the nervous system. Using NAC reduces the risk of nephropathy caused by contrast media, including acute kidney failure. Moreover, it is an effective therapy at a low cost and without any side effects. NAC has characteristics which allow fighting many viruses, e.g., the influenza A virus, as well as many pathogens in the form of bacteria, such as: Pseudomonas aeruginosa, Staphylococcus aureus, Enterococcus faecalis, Enterobacter cloacae, Staphylococcus epidermidis and Klebsiella pneumoniae. To sum up, Now Foods NAC is a versatile product with many benefits to health, which has been demonstrated in many academic studies. It is a dietary supplement mainly for people whose liver is exposed to damage through pharmacological medications that negatively affect its functioning. 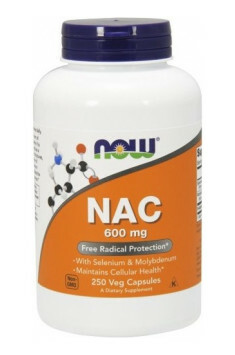 NAC cleanses the liver, supports its functioning and has a beneficial effect on kidneys. It also protects nerve cells from damage and is effective in many mental disorders. Thanks to its anti-virus and anti-bacterial characteristics, it is a very good supplement for people with weak immune system. The unique formulation with special health benefits. It increases physical performance and promotes recovery, making it an ideal supplement for physically active people. It is often recommended for athletes during and after completion of the cycle with the use of steroids and pro-hormones. It helps to regenerate damaged liver cells and helps cleanse the body of toxins. Its advantages also appreciate people Smokers and people who abuse alcohol. What's interesting - studies show that supplementation with NAC not only supports the body, but also helps in recovering from various addictions (nicotine, cocaine).I suggest taking 3 capsules per day. Preferably take the capsules in intervals of several hours. You should not take them at once - NAC raises glutathione levels (a substance which is the guardian of human health) in a relatively short time, because the distribution of doses over time will maintain its optimal level in the body. NAC is a safe substance and you can take it constantly. This is not a product to which the organism could be used, and with time develop resistance to its effects. Regular supplementation may be treated as an element of taking care of your own health.